The final result of Liverpool vs Manchester City in the leg 1st quarter finals (round of the top 8) Champions League 2017/2018, Thursday (5/4/2018) belongs to Liverpool host team. Playing at home, Anfield Stadium, Liverpool win over AS Manchester City with a conspicuous 3-0 score. Liverpool's goals were scored by Salah, Chamberlain and Sadio Mane. 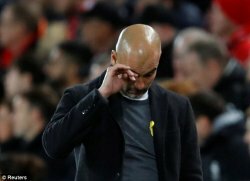 Pep Guardiola, after the match Liverpool vs Manchester city ended with the score 3-0, Thursday (5/4/2018). Playing at home Liverpool, Anfield Stadium, Thursday (5/4/2018) early morning West Indonesia (WIB), Liverpool appeared kicked off since the early minutes. Liverpool efforts to fruition in 12 minutes, utilizing operand Firminho in the penalty box Manchester City, Salah managed to menceploskan ball into Ederson Moraes goalkeeper. Pep Guardiola's team tries to equalize the score, but the catastrophe again occurs in minute 21. Alex Oxlade Chamberlain managed to register his name after launching a hard kick from outside the penalty box Ederson can not ignore. Equally playing open, Manchester City looks unable to escape from the pressure of Salah et al. Salah returned to play in the creation of goals Liverpool, his stomach bait on 31 minutes successfully used Sadio Mane to score goals. Until the final whistle sounded, no more goals are created. First-half Liverpool vs Manchester City ended with a score of 3-0 to Liverpool's advantage. In the second half, Pep Guardiola's side looked more in control of the game. Some of the opportunities created can not be produced into goals by both teams. Until the end of the second half there is no goal created. Liverpool managed to win by a score of 3-0 over the visitors, Manchester City. 0 Response to "Champions League Results Liverpool Vs Manchester City, Pep Forces Failed to score goals"